Last night I did a set of minis. They started off as braids but as I got increasingly frustrated with the way it looked they then somehow morphed into mini twists! I did a quick measurement before I started on my hair. The middle was about the same, just a little thinned out. The back was a little all over the place. There were a few short pieces, a few long pieces, and everything in between... When I combed it all together it measured at 13.5"
Heres a shot kinda showing what I am talking about. Around the perimeter, back and front, I have these pieces with nice roots and ends which taper off into nothingness. I'm going to end up clipping all of that off, no real reason to hold on to them. These 2 shots just basically show the way the hair has thinned. These are more so towards the middle. Here is the final product right after I finished. 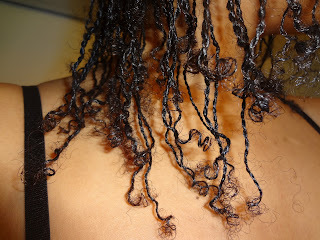 I like to twist dry and cowash when I'm done so they hang nicely and the ends curl up. The bottom 2 pics are after cowashing, as well as the pic at the top of the post. I'll wear these for a little while, until I get tired. Obviously, because they are twisted up there is a little shrinkage, but detangled and stretched I am about an inch above BSL according to this bra which is a tiny bit low on me. I am exactly at BSB otherwise, so that is what I will claim. Goal wise, I did make my goals for this year. Hopefully the hair does not continue to fall out and I will be back at BSL by the end of this year. My goal for MBL will obviously have to be pushed back a few months. 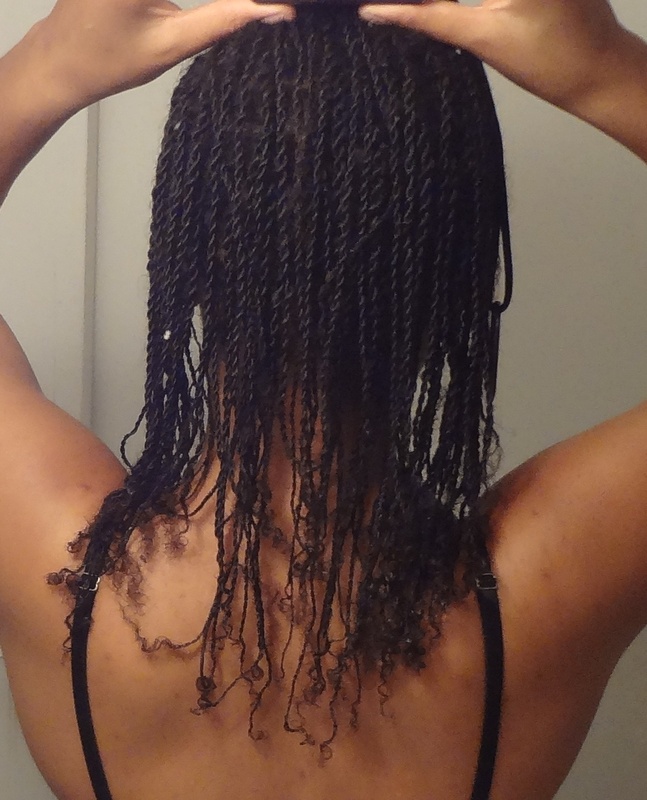 For my challenges, I want to continue both the Protective Style challenge, as well as the No Heat challenge into 2013. 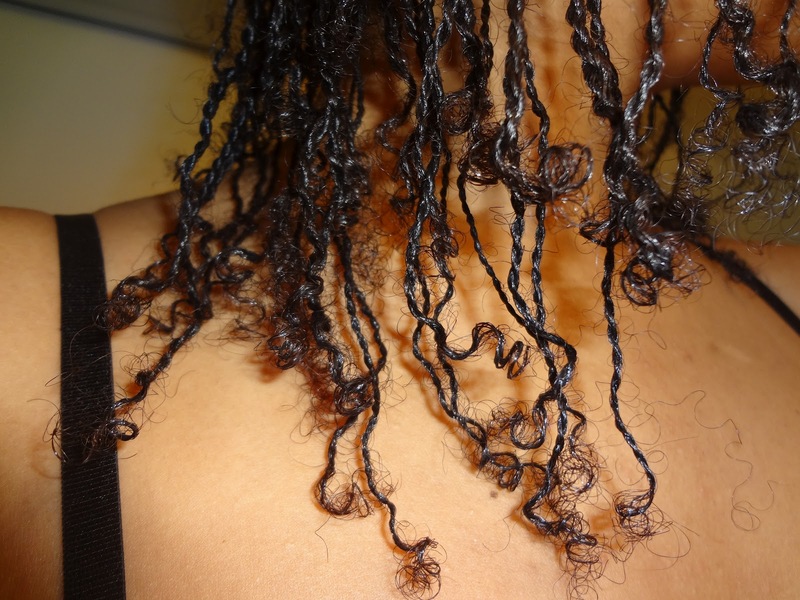 I am thinking a 6 month of Protective Styles and No Heat until the end of the year. My main goal from now into 2013 will be to thicken my hair back up. No growth aids and also I will be making my own products. No more commercial products aside from suave and a few deep conditioners. Making my own products is so much fun and I really appreciate the work and knowledge that goes into making something and then making it better. So those are my goals for next year.. 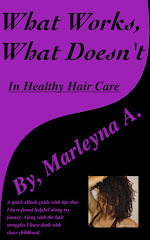 So, I was up all night making hair products and here is the other one I did. I whipped up a scalp cream last night. Was completely bored and decided to explore my creative process at 3am... I didnt do any real exact measurements so this will be just a little experiment of mine. The base ingredients are nothing spectacular, but its the additional stuff that really matters. I wanted it to be a thick cream so I did a 75% oils, 25% water. I used half hydrogenated soybean oil and half soft oils- Safflower, Hazelnut, Grapeseed, and Castor oils. I did add a little IPM to cut down on the greasy feel from the HSO. The colorant was a glycerine based pigment. It was actually purple in the bottle, but when heated up and mixed in, it turned a bright pink! How fun... I'm not all that turned on by colorant in my products, but I just wanted to add a little something extra. Finally I threw in a couple capsules of Biotin and EPO. This particular biotin I used is actually a liquid gelcap. No powder inside. It was actually perfect because is was a last minute inclusion, otherwise it would not have dissolved in. I added these to the cool down stage. After I whipped it up really good, I threw it into 2, 4oz jars and popped them into the refrigerator. I do think I might have added too much colorant, but its ok because I will be the only one using this. 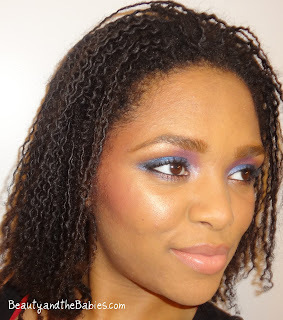 I did a mix similar to this a while ago, but I used regular sulfur powder and EPO. The base was mango and shea butter instead of HSO, and also I did not do an emulsion. That one was good, but the problem was that sulfur tends to give me sinus headaches at any concentration. This particular MSM by Jarrow actually doesn't surprisingly. I would love to throw in some peppermint and rosemary EO but I think that might be doing a little too much..
Last week, I took down my hair from the braids I wore for 2 weeks under my lace wig. Upon cowashing and detangling my hair began to shed profusely. I have been wearing my hair up for at least the past two months now and I guess because of that I haven't really noticed the shedding. During the past month I have been applying a generic MN cream to my scalp. I have used Miconazole Nitrate in the past with success, BUT it was a different type and a brand that we all know, Monistat. This time I used a generic antifungal for the skin. Having never used this before I knew it was going to be a bit of an experiment. I thought it was best to use it for a month only at first to see how my hair reacted to it. Again, I did not notice the shedding in the beginning. If I would have, I would have went ahead a stopped usage right then and there. 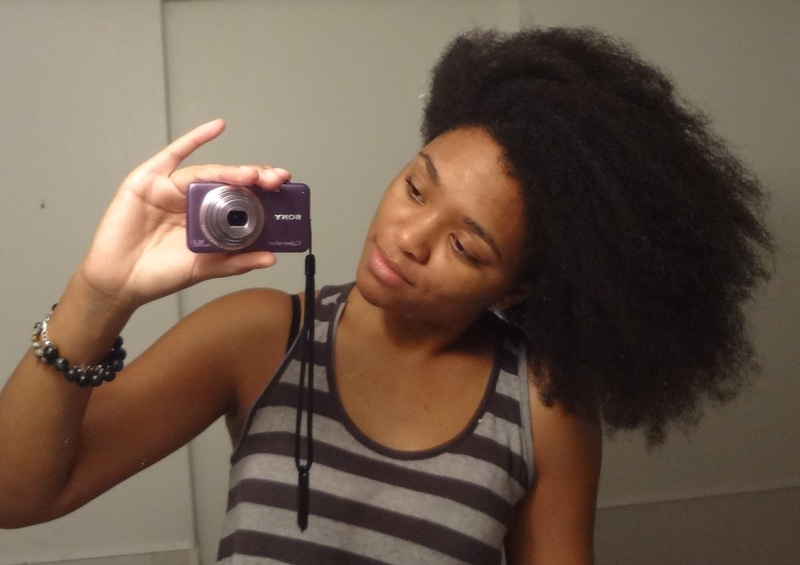 Plus, the fact that my hair was put away for most of that time, I didnt see any real problems. 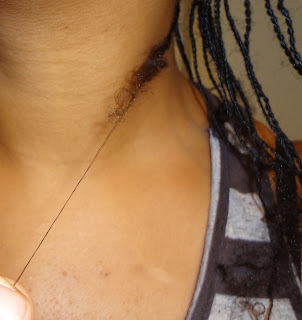 When I saw the shedding the other day, obviously I freaked out... lol. This is the usual initial reaction with me. But then, I began to try and come up with every possible reason why my hair would be shedding the way that it had. The mega-tek has been known to cause shedding and apparently for some, it stops after a while. I gave it a chance on multiple occasions, because I wanted it to work. I did see that 1" each month I used it, but the shedding was just too much. I couldnt deal, and it never slowed or stopped for me. The reason why I added the BKT to the list was because a few months after I did my last BKT, I did notice breakage on the ends of my hair. Soooooo...... I did a little experiment, I stopped everything. 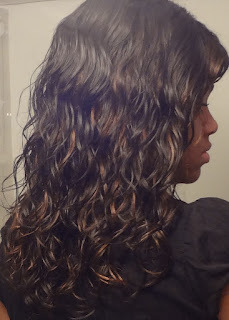 I stopped the vitamins, the MN, and I washed my scalp 2 days in a row to completely cleanse any leftover traces of the MN. I used a peppermint and rosemary shampoo, which has a wonderful soothing & cooling effect. Love that stuff. It works great for clarifying. Then, I sat and watched. I saved all the hair from each day I detangled for comparison. I have not measured my entire head for this quarter and although I made great progress, I do believe that this setback has pushed me above BSL. 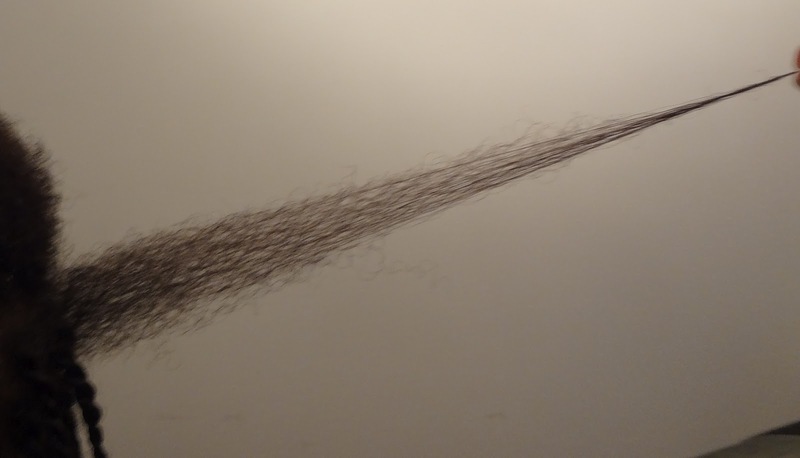 The first and largest ball of hair is the 2 week hairloss - 14 days of shedding. Ball number 2 is the amount I lost the very next day. - 1 day of shedding. Ball number 3 is the amount I lost on the 3 day. - 2 days of shedding. It is shedding less and less each day. I did notice that the more often I cowashed the less my hair shed as well, so I have been avidly cowashing every 1-2 days. 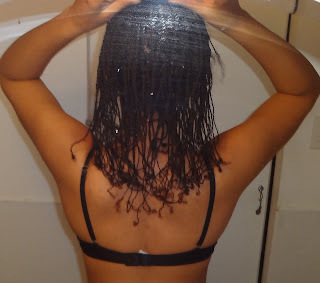 I have been wearing my hair in a banded or braided ponytail, shown below. 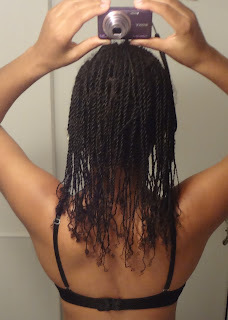 So I think I am going to go with some more mini twists or mini braids. 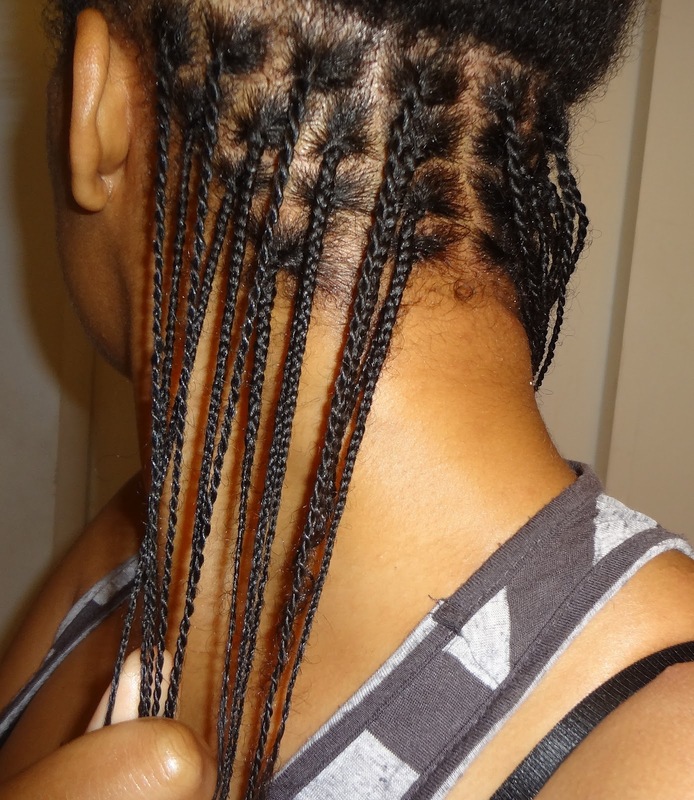 The braids do hold much better than the twists do when washing so I think that may be the better choice. My hair is still shedding, but it has slowed down a lot. Once it stops, I will start back up on my vits. I have never had an eating disorder. I love food and love to cook. I also like to have a body that is clean inside and out so I fast every few months for a few days. The other night, I went to McDonalds. Hungry but not starving. I got 2 cheeseburgers a large Mocha Frappe and some chicken nuggets. I would have been just fine with just the frappe and the nuggets, but my eyes have always been bigger than my stomach. McDonalds food is not good for my body and I know that, so my first thought after chowing down, was to throw it all up. Get it all out now so that it did not tear up my insides later. All of that to say, I can see how easy it is to develop an eating disorder. Sometimes, I feel like doing it just to keep my figure. I have been working on getting this little bit of weight that I have off for a few months and it has really proved to be an obstacle. I have not been as persistent as I could be, but I still try to run at least every other day. The Mcdonalds bloated me up like crazy. Its been a few days and with my daily miles, I managed to work it off and I look fine. At this moment in time, I feel like I am in a weave funk. 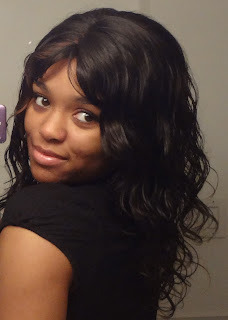 I have been wearing nothing but my drawstring ponytails and lace wig for a good while. I really want to do a style with just my hair but at the same time I want to keep my fake hair going. I am still on my protective style challenge and I am giving myself until the end of the year before I wear my hair out. But that itch is still there. I want to do a rollerset or a set of curlformers. If I do, I will have to wear it up, which in my opinion kinda defeats the purpose. I'm going to try and hold out a little longer on wearing any natural styles. I love the ease of this wig. She is just so beautiful. Still a little wet here, just finished washing her. All I do is braid my hair down really quick, once a week or so, and apply a moisturizer every other day to my natural hair, as well as my MN daily when I remember it. The wig I co wash every 2 days and air dry. Apply a little John Frieda Dream Curls and some hairspray. Then scrunch as it dries. 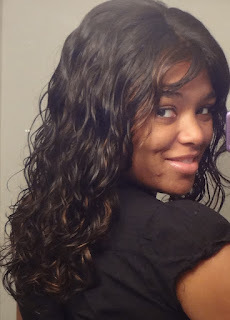 The curls come out so lovely! The MN I havent been a consistent with as I could be but I am going to continue using it until this first tube is empty. I still havent done a full length check for this quarter, but I will as soon as I have time to sit in front of the camera, sometime this week hopefully.